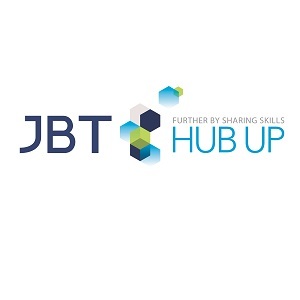 JBT HubUP is company and an entrepreneurial alliance (Groupe JBT, Opia technologies, Sibaya BCPharMed, R&D Project Managing, Eveon, ICM France and Progress Silicones) which offers the pharmaceutical and medical industry a unique solution for developing innovative medical devices by gathering all necessary professional skills from day one of a project : from design to qualification through components manufacturing and their assembly. This unique French national alliance represents a turnover of 100 million euros with 11 worldwide production sites and 3 000 m² of cleanrooms. With over 850 people, these seven key players cover the complete necessary skills to speed-up and successfully enable innovative medical devices development. Depending on projects and on required skills, these companies can count on the recognized experience of each partner, namely, plastic injection and mold manufacturing (Groupe JBT), design and registration of medical devices (Opia Technologies), industrialization and project management (Sibaya BCPharMed), design and fabrication of machines and automatized production means (RDPM et ICM), design and development of connected fluidic devices (EVEON) and LSR silicone injection (Progress). JBT HubUp is composed of different sized companies all customer oriented, eager to propose solutions to facilitate and speed up the time to market. Once the necessary partners are identified for the need of the project, a unique interlocutor is appointed to take charge of the customer relationship. This representative understands and manages the complete activity for the customer from design phase to industrialization and automation of the assembly. He ensures the coordination of all partners who commit, in a team spirit to respect values such as loyalty and responsibility towards other partners, customers and suppliers.